Children learn by example and if they see the adults in their lives working on the three “R’s”, reduce, reuse, recycle there is a good chance that they too will become environmentally responsible. Setting up a green classroom may seem like like a daunting task but its really very simple to do. 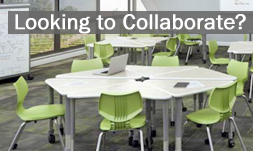 There are many eco-friendly school furniture products available as well as many ‘green’ school supplies on the market. Teachers can make many small and easy changes in order for their classroom to be more eco-friendly. Here are some helpful tips in your quest to be more green. Encourage the children in your classroom to recycle everything from plastic drink bottles, aluminum cans to paper by having clearly marked recycle bins in the classroom. If new recycling bins are not in the budget, simply use discarded cardboard boxes or school furniture boxes from the office. Set an example for the children in your classroom by always remembering to turn off the lights and other electronic devices whenever you leave the classroom. You could even appoint a child the job of light monitor and let them be in charge of insuring that all lights are turned off in the classroom whenever you leave it.Turning off lights when not in use is good for the environment and your schools budget. On sunny days open up the blinds in your classroom and let the sun light up your classroom instead of the electric lights. Natural light is known to be healthier than artificial lighting sources. However you need to make sure that the natural light in your classroom is bright enough for children to read and learn in. Instead of cleaning your classroom with expensive chemical laden cleaners switch to natural cleaners instead. There’s no need to buy expensive green cleaners though many effective and environmentally friendly cleaners can be made from common household ingredients such as vinegar, salt, borax and bleach. Encourage children to tightly turn of the faucets after washing hands or cleaning up. If you do have a faucet that drips notify the maintenance staff and have it fixed as soon as possible. To demonstrate to children how much water even a little drip wastes, place an empty gallon milk jug under a dripping faucet and time how long it takes for the drip to fill it with water, and then multiply that to find out how many gallons of water are wasted in a twenty four hour period by a leaking faucet. In order to conserve paper and make your classroom more eco-friendly encourage children to use both sides of the paper for assignments. You can also combine worksheets to take advantage of both sides of the paper when using printed copies of lessons. Instead of sending several notes home a week start a class newsletter or calendar and include all the information about upcoming events for the week or month. Starting a classroom garden is a great way to teach children about the environment, sustainability and the food we eat. If you don’t have a plot of ground you can start a garden in, get creative and make a garden in a window box planter, hanging baskets or even reuse empty metal coffee cans to house your plants. Create a more eco-friendly classroom by using green supplies whenever possible. Try switching to water based paints for art projects, biodegradable cornstarch pens, recycled paper and pencils made from recycled materials such as newspaper or reclaimed wood. Brainstorm with your students about different causes they are interested in supporting and then as a group chose a a cause that your class would like to support. This could be anything from adopting a rain forest to pledging to clean up a local park. Don’t forget to teach the three “R’s”, reduce, reuse, recycle on a daily basis. Doing so will help reinforce these important concepts. You might even want to take a few minutes out of every day where children can share what they did that day either at school or home that helped the environment. Most people want to be eco-friendly but for the most part at least currently sometimes going green technlogoy is not financially a good idea currently.I have looked at eco-friendly and green technology alternatives like igo green charger and have adapted where it makes financial sense. So far I have also installed solar panels on my home but while looking for a electric car I find the cost doesnt justify it for me. While I am passionate about making green choices and opting for green technology whenever possible it is up to people like you and I to spread awareness and let the companies know there is a demand. Your website looks popular and I think you can help influence society with your insight and green technology tips. By the way I found your site by searching ” The Eco-Friendly Classroom « « School Furniture Blog School Furniture Blog ” and you were the first result. So I think your website is a perfect platform to discuss ideas that are thought provoking to help influence your readers to go green. – Good luck with your site, you deserve all the success! Please continue to talk about more eco-tips/green tech, every idea helps us get closer day by day! Thanks for your intriguing article. Other thing is that mesothelioma is generally a result of the breathing of fibers from mesothelioma, which is a dangerous material. It really is commonly viewed among employees in the construction industry who’ve long contact with asbestos. It is caused by living in asbestos insulated buildings for a long period of time, Genetic makeup plays an important role, and some persons are more vulnerable on the risk compared to others.